What is the role of architecture if not to realize a shared vision of the “good life,” a vision that in the age of architectural modernism shaped—and was shaped by—a range of ideas about the home? With The Good Life, Iñaki Ábalos serves as our guide for a tour of seven iconic twentieth-century homes that represent various concepts for living. Some of the homes were actually built, while others were merely planned, painted, or created as part of a film set. We see Mies van der Rohe’s House with Three Patios, Martin Heidegger’s cabinin the Black Forest, Picasso’s Villa La Californie in Cannes, and the New York loft that Andy Warhol called the Factory. From the ultramodern geometric houses and gardens in Jacques Tati’s Mon Oncle, we travel to the famed hobby-kit house in Buster Keaton’s One Week and on to the sunny swimming pool and home in David Hockney’s painting A Bigger Splash. 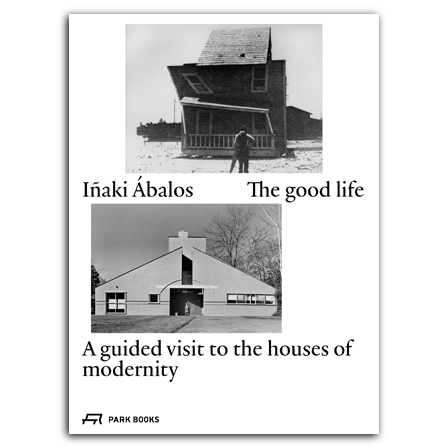 Ábalos takes readers through the key philosophical precepts that likely guided the creation of these homes, making insightful points about the relationship between ideas about a particular modern way of living and approaches to architecture and design. What he concludes is that modernism marks less a coherent triumph of positivism, as is often assumed, than a loose celebration of the radical pluralism of the twentieth century. A fascinating work by one of Spain’s most prominent architects, this new edition presents a powerful picture of the concerns that guided the course of architectural modernism. Named one of the Most Beautiful Swiss Books 2017.
is co-director of Ábalos+Sentkiewicz Arquitectos. He is also a Professor of Architectural Design and director of the Laboratorio de Técnicas y Paisajes Contemporáneos (LTPC) at ETSAM since 2002 and Professor-in-Residence at Harvard Graduate School of Design since 2012.